1906 EARTHQUAKE: THE LONG CLEANUP The 1906 earthquake flattened much of downtown Santa Rosa, and it took an army of workers six weeks to clear just the worst of it. What happened to that mountain of rubble? Most of it was hauled away by train, as shown in many photographs of men with shovels standing next to flatcars (perhaps they would have done more shoveling and less standing around if the town had paid them more than $2/day, which was 50¢ below the prevailing wage for manual labor). But not all the debris left town; some was apparently used as riprap on the creeks, and hundreds of loads were used by Santa Rosa as fill for the approaches to the new E street bridge. As a result, the banks of Santa Rosa Creek were squeezed together by over one hundred feet, the first in a century of abuses to a waterway that had salmon runs so plentiful that fish could be caught barehanded. THE MAN WHO WOULD BE SIDEWALK KING There couldn’t have been a more dolorous figure in early 20th c. Santa Rosa than Joseph Forgett, whose love for opium led him further and further down unlovely paths. In 1905 he was charged with carrying a meat cleaver under his coat and stealing an opium pipe; nearly two years later he was the ringleader in a jail break. The items below from early 1907 document what he was doing inbetween, including fraud and petty theft. THE STREET KNEE-DEEP IN MUD Enough with the complaints about potholes on Santa Rosa streets; a little over a hundred years ago, there was a crater on Sebastopol Ave. that regularly sank buggies up to their axles – and considering that a buggy axle was between 16-26 inches off the ground, this was a Pothole From Hell, indeed. And even worse, it took the town over three years to patch it. The problem was apparently a feud between the town and the owners of a property at the corner of Boyd street, who refused to sell their 14-foot frontage to allow the street to be widened and drainage added. Until it was resolved in 1907, it was a frequent topic of hand-wringing at City Council meetings, with it even proposed that a bridge should be built over the hole. ANY ROBIN ON THE MENU? It may sound Henry VIII-ish today, but at the turn of the 20th century, songbirds baked in a pie, particularly robins, were considered good eatin’ by many. The group that came to Sonoma County in 1907 for robin hunting soon would face a change to the law that made it a felony to harm or deal in robins, meadowlarks and “any wild bird” (except for sparrows, bluejays, pigeons, and other birds considered pests). The crime was later downgraded to a misdemeanor. Few people who have not visited the E street bridge know of the extensive improvements that are being made in connection with the erection of the new bridge. In a few days the bridge will be opened for traffic. The bridge is a pile bridge with one span of forty-six feet. The approaches of the old bridge have been cut down so that the main bridge and approaches together are only a little over ninety feet. Before they were over two hundred feet. Hundreds of loads of old brick and debris–have been used in filling in the approaches so that the bridge will be on a level with the grade of the street. Joseph Forgett was arrested Saturday morning by Constable Boswell, charged with having embezzled a sum of money from a physician. He is alleged to have represented to the physician that he was in the employ of Henry Von Grafen, and that he had a large sum of money due him. On the strength of this statement he secured some coin. Later it was learned that he had not been in the employ of Von Grafen at all. Forgett at first tried to put the officer off by saying he would come down town later, but Boswell would not stand for that, and brought his man to the court. Justice of the Peace Atchinson released Forgett on his own recognizance to give him an opportunity to raise money. Joseph Forgett, a man sent over to the county jail yesterday for thirty days by Justice Atchinson found himself deprived of his “dope” at the jail last night, and he set up a howl and evinced insanity. His shouts were echoed by those of other prisoners and iron cell doors were rattled. The noise was heard for blocks and people hurried to see what had happened. The noise was soon silenced, however. Forgett’s wife also came to the jail stating that she had nothing to eat and nowhere to exist in warmth. Joseph Forgett is again in the toils of the law. This time he is alleged to have stolen a sack of dried apples weighing more than fifty pounds, and when the warrant was sworn to for his arrest he was charged with a prior conviction. The officers claim to have information as to where Forgett sold the apples and feel certain of convicting him. Justice Atchinson set the case for hearing Friday and fixed the man’s bond at $300 cash, or $500 personal bonds. Forgett is unable to give bonds and is in custody of Sheriff Jack Smith pending his examination. Joseph Forgett will spend the coming eleven months in the county jail. This was the judgment pronounced by Justice Atchinson Friday afternoon. It was understood that Forgett wanted a sentence of sufficient duration to enable him to break off the morphine habit. During this time he will be kept away from the drug and it is his intention when given his liberty next year to refrain from its use. He entered a plea of guilty to charges of petty larceny and obtaining money under false pretenses. The unsightly mud hole on Sebastopol avenue near the California Northwestern depot is soon to be a thing of the past. At the council meeting Tuesday evening the matter was taken up and decided upon a proposition made by Messrs. L. B. Henry and Cummings, who have secured an injunction against the city to prevent certain street work being done on Sebastopol avenue. In consultation with Street Commissioner Decker recently Messrs. Henry and Cummings proposed that if the [illegible microfilm] grade Boyd street from Sebastopol avenue to the slough, a distance of 260 feet, they would give the city fourteen feet in front of their property. This will permit of the widening [sic] of Sebastopol avenue and the construction of a new sidewalk on the south side of that thoroughfare. When the work has been completed and the street widened there will be ample room for teams to pass when electric cars are being operated. This will be good news to the people of that section of the city and to all who had to traverse that section. For some time past Sebastopol avenue has been almost impassable because of the mud holes there and under this proposal this will be remedied. The council agreed to accept the suggestion and City Attorney Geary and Street Commissioner Decker were authorized to accept the proposed agreement, and when a deed has been given to the fourteen feet a resolution to grade and gravel Boyd street will be passed by the council. The hearing of the injunction suit brought against the city will be called Thursday and this will settle the matter without the necessity of the courts. The mud hole on Sebastopol Avenue has been causing all kinds of trouble lately. Thursday a wagon heavily laden with eggs was en route to the cold storage plant of the National Ice Company, and became stuck in the mud hole. The efforts of the team were unavailing, and the wagon could not be moved. Another express wagon was drawn up alongside the mire and two-thirds of the load transferred, and the team was then able to move the load of eggs. Recently an automobile became stuck in the mud there and other vehicles have mired down. The disgraceful condition of the roadway on Sebastopol avenue, near the railroad crossing, is at last going to be remedied. The injunction suit which has held back the repair of the road for many months will be dismissed and at once and the property owners, Messrs. Cummings and Henry, have given deeds to the city to a strip of land in front of their property, in return for which the city will repair the street, grade and put down sidewalks, etc., and grade Boyd street so that a proper drainage for surface water will be provided. An agreement to this effect was reached and a resolution adopted at last night’s council meeting. Colonel L. W. Julliard, representing the Henry and Cummings interest, told City Attorney that he would dismiss the suit today. Last Sunday a party of four members of the French colony in San Francisco came up to Sonoma to spend the day and do a little hunting. They killed a number of robins and one of their number in addition broke the ordinance regarding the discharging of firearms on the county road. The men were arrested and haled before Justice J. B. Small. They paid fines that aggregated sixty dollars and went on their way home to San Francisco hardly feeling as if the sport they had enjoyed had been worth the while. If the name of letter-writer Marsden Manson is familiar to anyone today, it’s because of his shameful role in five-year campaign by San Francisco to flood the Hetch Hetchy Valley for use as the city’s reservoir. Starting the following year, Manson would become the point man attacking John Muir and what he called the “short-haired women and long-haired men” in the Sierra Club, whom he ridiculed as sentimentalists standing in the way of San Francisco’s glorious future. Marsden Manson, the well known civil engineer of San Francisco, who is at present doing so much in planning and designing the new and greater San Francisco, has found time to interest himself in the beautifying of the new and greater Santa Rosa. San Francisco, Jan. 11, 1907– The Editor of the Press Democrat, Santa Rosa, Cal. : Santa Rosa is the point towards which the agricultural scientists of the world look with great interest. From this far away town have gone forth to the world plantforms new to nature; and. which have added millions to the wealth of those who till the soil. In rehabilitating the grounds around your new court house let the grass, flowers and trees be those developed and improved by Luther Burbank. Let every front yard present one or more of the flowers he has given the world, and let that world know that some of the choicest products of his work greet the stranger, who visit your town, at every gate with the beauty and odor of some flower which has made Santa Rosa the mecca of the scientific horticulturalist and florist. Luther Burbank has promised to aid the movement started by the Women’s Improvement Club and endorsed by the Chamber of Commerce and other organizations for the beautifying of the City of Roses. At a joint meeting of the committed of the Improvement Club…Mr. Burbank willingly promised a generous gift of flower seeds and later of bulbs and plants and to aid in every way the movement to make the gardens of the city blossom as the rose by the time of the rose carnival in May. The promised gift from Mr. Burbank fired the committee with enthusiasm and he was heartily thanked. The most enjoyable part of writing this journal is finding stories in the old papers that reveal (mostly) forgotten bits of our mutual past. Sometimes these are entertaining glimpses of great-grandpa’s life, such as the bottom of the barrel vaudeville acts that played in Santa Rosa during the earliest part of the 20th century; othertimes, these stories in the local papers cast light on important – and sometimes shocking – chapters of American history. And “shocking” best describes the newspaper’s accounts of the angry 1907 City Council confrontations between anti-liquor advocates and their “wet” opponents, which found both sides hinting they would destroy the town via boycotts or blacklists if they did not get their way. In early 20th c. Santa Rosa, the temperance movement was little noticed until this showdown over the future of downtown Santa Rosa. Before the 1906 earthquake, bar room doors opened at five in the morning and closed at midnight. Saloons were ordered closed for about a month after the disaster, and then allowed to reopen between 8AM to 6PM. By midsummer those times were stretched two hours in each direction, and now in March, 1907, the Council was debating a new liquor ordinance that would keep the bars open until ten at night. The forces of temperance wanted to keep the 8PM closing time plus adding complete shutdown on Sundays. And although it’s not stated in the articles transcribed below, another grave concern of the teetotalers had to be the speedy return of the saloon scene in post-quake Santa Rosa; while most merchants and public services were struggling to regain footholds at the end of 1906, there were about three dozen saloons downtown, most of them along Fourth St. between Railroad Square and Courthouse Square. The showdown began cordially at a late February 1907 Council meeting that had the audience packed with temperance advocates. Local brewer Joseph Grace and Rev. William Martin debated the Sunday closing issue, shook hands at the end, and everyone went home well pleased. At the following Council meeting, the tone turned darker. Rumors had been floating that week that the ministers were keeping a list of people who didn’t want to sign their latest petition. The Brewers’ Association now told the Council that there would be a boycott of Sonoma county’s entire hop industry if a Sunday closing law passed. Former Judge Barham presented a counter-petition asking for extended saloon hours, and noted that restrictions were “a step towards prohibition and that prohibition hurts towns.” At the same meeting, a PD reporter spotted two of the ministers were making a list of everyone present, but the paper was told it was “merely a question of getting statistics…to keep a record of the names of the people we saw” and not to create a blacklist. In the four days until the next meeting, tempers must have been roiling in Santa Rosa; when the Council met again, even the aisles were filled and the faces of latecomers pressed against the windows. As the last words were uttered, one could have heard a pin drop, so tense was the feeling. The silvered head of courteous, kindly Judge Barham dropped as from a sudden blow, his bowed frame shook with suppressed emotion, and after a moment he quietly arose and with tears in his eyes slowly and hesitatingly passed from the room and out into the night. Whether it was the attack on Barham or the influence of business interests (or both) we don’t know, but at the following Council meeting, the saloonkeepers were given everything they wanted: No Sunday closing, longer hours. 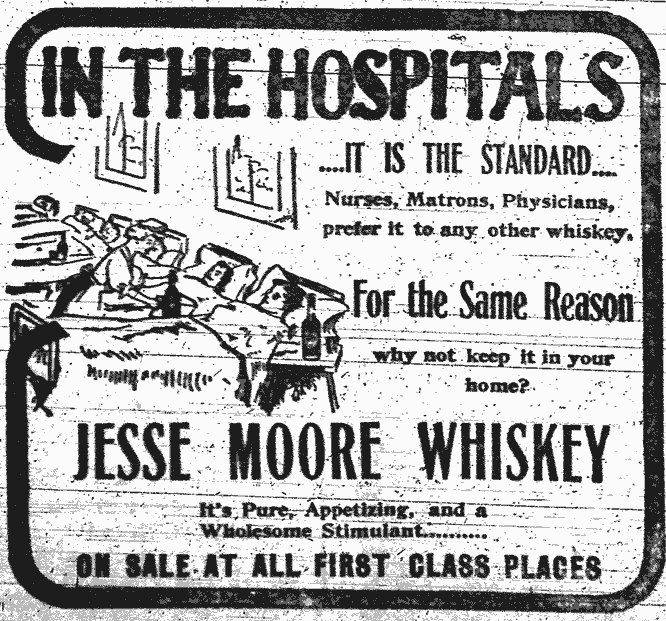 I confess that the virulence of the anti-liquor forces surprised me; ax-wielding Carrie Nation tactics aside, I had presumed that the temperance movement hugged the rational, moral superiority of sobriety. Not so at all, according to the excellent book on the pre-20th century temperance movement, “The Alcoholic Republic” (and which I cannot recommend highly enough). The anti-liquor war was an often hysterically-emotional crusade by 19th century American evangelicals, some of whom thought booze a greater evil than even slavery. “Temperance advocates did not comprehend their own arrogance in attempting to impose their views upon segments of the populace that were hostile…the cry of abstinence was an attempt to cement the broken fragments of American society, but the leaders of the temperance movement could never gain the kind of unanimous consent that would have been necessary for the success of the cause,” the author explains. The city council played to a crowded house at its adjourned meeting on Wednesday evening. Standing room was at a premium and there were probably more than a hundred people crowded into the little basement room which is being used as a council chamber. There was plenty of interest in the matters to come before the council, the consideration of the proposed liquor ordinance [sic]. Speeches were made for and against the Sunday closing of the saloons, the bright particular speech being made by Rev. William Martin. His remarks provoked the entire assemblage to laughter at the witty manner in which he turned the tide of the previous speaker and the mayor and councilmen laughed heartily at his witty sallies. Joseph T. Grace took up the cudgels for the saloon and said that he was not aware what had caused the people to believe Santa Rosa was such a wicked city. He said he disliked to see a drunken man as much as anyone and remarked that it was not the use of liquor that did the harm, but the abuse of it. He declared the saloons were being blamed for something if which they were not guilty, and asked that some speaker point out a single occurrence within five years that could be traced directly to the fault of the saloon. The speaker concluded by saying that anything which [illegible microfilm] the saloons would have the opposite to the desired effect and cause a greater demand for liquor than now existed. Rev. William Martin took up Mr. Grace’s thought, and cleverly turned the statements of Mr. Grace. He referred to the restrictions causing a greater desire for liquor, as stated by Mr. Grace, and said that from that standpoint he thought evidently that Mr. Grace would join the petitioners in asking for Sunday closing, as according to the previous speaker, it would create a greater demand for his manufactures. The speaker continued by calling attention to a recent occurrence in which there was a fight on Saturday evening in which the entire police force was called to quell a disturbance and dryly remarked that the parties who had caused the disturbance were not attending a meeting being held that evening at the Christian church but had been visiting the saloons. He called attention to the fact that while the saloons paid more than any other business to the government, it also cost the government more to deal with the saloons and handle them. At the conclusion of the meeting Mr. Grace and Rev. Martin shook hands and had a merry little chat over their forensic passage. The best of feeling prevailed throughout the meeting among the contending forces, and there was nothing acrimonious in the entire debate. The council went into executive session to consider the matter and the large audience slowly filed out into the night. Again anticipating that there might be “something doing” in the matter of the saloon license there was a “full house” at the Council meeting Wednesday night, representing both sides of the controversy, but the consideration of the ordinance went over to Friday night and this particular ordinance may not be brought up then as there are many others. “On behalf of the 2,000 boys and girls of this city, who are now exposed to the vile language often heard in front of the saloons, we earnestly and prayerfully petition your honorable body to close all saloons at 8 o’clock p. m. on week days, and all day on Sundays so that some of the temptations of youth may be moved. Oratory, mingling repartee with matter of more serious vein, entertained a large audience at the meeting of the City Council last night, at which time the Sunday closing of saloons formed the chief topic. Several petitions dealing with the question pro and con were first disposed of, and then the oratory began. The audience included people of all classes. The ministerial union was represented by the Revs. Lelander Turney, M. H. Alexander, Peter Colvin, and Arthur B. Patten. After the transaction of the preliminary business Mayor Overton called for the reading of petitions and communications. Clerk C. D. Clawson read a communication from the Brewers’ Association of San Francisco, threatening to place a boycott on Sonoma county hops if the proposed Sunday closing law was adopted. This communication will be found in another column. Mayor Overton invited anybody who desired to do so to speak and Frank W. Brown, representing the saloon-keepers, arose and stated that all they asked was to be allowed the same conditions in their business existing before the earthquake, leaving the matter of the license fee optional with the City Council. He referred to the fact that they had suffered losses at the time of the earthquake like everybody else. After the reading of the communication Mr. Barham said he wished to impress upon the minds of the councilmen that prior to the earthquake of last April Santa Rosa was equal as regards peace, quiet, and sobriety to any city of its size anywhere. He called attention to the fact that that night in the jail of Sonoma county, from all the cities and towns and hamlets, there were just seven men charged with crimes. He asked why at this time, when the city was being rebuilt, and things were going along well, a pattern to all the world in the energy being displayed, and agitation such as this should be started. Referring to the communication of the Brewers’ Association Judge Barham said it was an unfortunate thing hat the word “boycott” had been used and people did not like the word. He asserted that the Association meant what it said and he instanced the boycott put upon Lake county hops, where local option had been brought about by the imposition of an exorbitant license. Judge Barham called attention to the importance of the hop and grape industry in Sonoma county, each of which yielded over a million dollars of revenue and a vast proportion of it being paid out for labor. A plan suggested by the speaker for the proper policing of the saloons was to have each saloon man, so to speak, a policeman, and hold him personally responsible for the conduct and orderliness of his place of business. Let saloon men know that the saloons must obey the laws and let the officers know also that the strict letter of the law must be obeyed all the time, he said. He suggested further that the license must be raised to $240 a year. The speaker said the Sunday closing suggested was a step towards prohibition and that prohibition hurts towns. He asked the council to consider the interests of the owners of three million dollars worth of property and also the immense hop and grape industries of the county before they took a definite stand. After some more argument along the same lines Judge Barham referred to the ease with which signatures to petitions were often secured. Mayor Overton smilingly asked Judge Barham if his petition was included in the coterie of petitions mentioned. This was followed by some good natured repartee and an exchange of laughter in which all joined. Rolfe L. Thompson stepped into the arena and said that he was prompted to speak by some of the remarks of Judge Barham. He said he felt and the people generally felt that in their representatives on the council they had men in whom they had every confidence and who would do what they considered best for the community. He realized that they represented the liquor interests as well as the church element. He then proceeded to analyse some of the statements of the speaker who had preceeded him. He alluded to the petition signed by the 134 residents and business men and said it was certainly worthy of full and careful consideration. Mr. Thompson called attention to the club held over the head of the council by the Brewer’s Association, and said that he did not think anything would come of it. San Francisco should not be allowed to dictate the policy of Santa Rosa’s government, he contended. Comparing the hop and grape industry with the poultry industry, he instanced the great revenues now being derived from the latter, and said that in view of the unlimited possibilities he did not thing much need be feared even if the hop and grape industry should be attacked. He also called attention to the fact that our hops are sold largely in the east and in Europe, and not in San Francisco. Mr. Thompson concluded with an earnest plea for carrying out the wishes of the 134 citizens and business men who had signed the petition in favor of the Sunday closing law. He said they must certainly have thought hat Sunday closing was a good thing. It was a question of prohibition, he said, but simply the reasonable suggestion of men who thought the course asked for was the best for the city. As the last words were uttered, one could have heard a pin drop, so tense was the feeling. The silvered head of courteous, kindly Judge Barham dropped as from a sudden blow, his bowed frame shook with suppressed emotion, and after a moment he quietly arose and with tears in his eyes slowly and hesitatingly passed from the room and out into the night. When the hearing had come to a close and the petitioners and spectators took their departure, Mr. Patten went to his home. Later he returned to the council chambers, where the Council was still in session, and expressed his regret at having indulged in any personalities during the course of his remarks, explaining that in the intensity of his feelings he had forgotten himself and been carried further than he had intended to go. But save for the Mayor, the members of the Council, a few of the other city officials and the newspaper men, at that late hour the council hall was well-nigh deserted. And dignified, courteous, kindly John A. Barham was not there to hear. A petition signed by 906 women was presented to the City Council last night when a further hearing was given the promoters of Sunday closing in Santa Rosa…Mrs. George J. Reading arose and addressed the meeting. She called attention to the temptations put in the path of the youth by the saloon, and after mentioning cities such as Redlands, that had flourished under prohibition, then handed the petition to Acting Clerk Mobley with a request that he read it, and the names of the women subscribing to it. The minister then reiterated his statement of last Sunday relative to the course taken while circulating the petition for Sunday closing among the local business men, and denied that anything like a “blacklist” had been kept by the Ministerial Union. They were simply out for the facts and statistics, he said, It might be mentioned here that the statement referred to was that when a business man had declined to sign upon the ground that it might cost him some trade, he (the speaker) had only made the local reply, which was to ask him if he did not also think that he might lose some trade if he did not sign. Mr. Patten’s speech was an earnest, well worded, strong presentation up to the time when he indulged in a very unfortunate personality [attack] against Judge Barham, who it will be remembered appeared at a previous meeting of the City Council as the attorney for a number of property owners, and asked that in view of the rebuilding of the city that things as affecting the saloons be allowed to remain as they were prior to the earthquake. To this personality, which aroused much strong comment and feeling, reference is made elsewhere in this report. When he went to leave the building the minister faced a crowd of men who protested against what he had said to Judge Barham. On being taken to task and questioned as to his informant, the minister mentioned the name of a well known professional man. Mr. Patten said if what he had said was not true he would be one of the first to apologize to Judge Barham. Later, after the Council had taken up the consideration of other matters, Mr. Patten appeared and apologized, excusing himself on the ground that he was spurred on to say what he had by his feelings at the time, and said he hoped the council would not allow what he had said to effect their action in the saloon matter or to weigh against the cause, but would let it go against him personally. With this the incident closed. The city hall was crowded to its utmost capacity. Many ladies were present. The entrance to the hall was blocked, and at all the windows on the outside were faces peering from without. Great interest was manifested in the proceedings. The City Council last night finally passed the new license ordinance which includes among other things the increase of the saloon license to sixty dollars per quarter, and allows saloons to remain open daily from six o’clock in the morning until ten o’clock at night. Prior to the adoption of the ordinance Councilman Reynolds called attention to the fact that the new ordinance provided for the hearing of remonstrances against the opening of saloons on Sundays, etc, and asked that the petitions, one signed by business men, and the other by property owners, the former asking for Sunday closing, and the latter, whom Mr. Reynolds addressed as “millionaires,” asking that the saloons be allowed to run with similar restrictions as before the earthquake, he read. Under the law laid down in the ordinance he said he thought the petitions should be considered. He also mentioned that the Council were asked to submit the question of Sunday closing of saloons to a vote of the people. The petitions were read. Its was suggested that the matter had been pretty well threshed out heretofore, and the question was finally called for and the vote recorded as stated. At the conclusion of the meeting the ordinance was signed by Mayor Overton and will be officially published in the Press Democrat tomorrow morning. One of the provisions of the new ordinance relates to the powers of remonstrance regarding the opening of saloons in locations where they are not desired, the setting of a time and place of hearing remonstrances, etc., and of complaints regarding infractions of the laws, in conducting saloons. The ordinance also abolishes all card playing and other games heretofore conducted in some cigar stores. Gambling is also prohibited. The restaurant license, allowing the serving of wine or beer at meals is increased by the new ordinance of twenty dollars per quarter. Slot machines are licensed five dollars per quarter. The license for all circuses will be fifty dollars. Skating rinks will be twenty-five dollars a quarter. Drug stores where liquors are sold will be twenty dollars a quarter. Traveling merchants or peddlers must pay a license of ten dollars a month, or two dollars per day when they peddle for loss than a month, and two dollars a day additional if they have a horse and vehicle. This excepts the peddling of fruit or vegetables, products raised by the person offering the same for sale.